Preparing my upcoming CMG'12 presentation about SEDS-lite I try to formulate what SEDS or extended version of that - SETDS actually is. SE(T)DS is Statistical Exception (and Trend) Detection System. It is not an application. But could be implemented by developing one. And I have done that several times (using SAS, COGNOS, BIRT, R and other programming/reporting systems). But developing SETDS-like reports/apps is just a beginning. The most important part of SETDS is how to use that for Systems Capacity Management and how to build that in the Service Management processes. The set of my CMG papers I wrote since 2001 (list is in the very 1st post of this blog) describes that in details. By the way it is not absolutely necessary to develop the SETDS application because starting from BMC PP and visualizer (now it is Capacity Optimizer, Perceiver and Proactive Net) a lot of performance tools have SETDS-like features and this blog has several posts analyzing them (e.g. see Gartner's Magic Quadrant). A Capacity Manager just need to know how to use the home made or vendor based SETDS-like tools features efficiently and SETDS is the method. SETDS is the methodology of using statistical filtering, pattern recognition, active base-lining, dynamic vs. static thresholds, IT-Control Charts, Exception Value (EV) based reporting/smart alerting and EV based change points/trends detection to do Systems Capacity Management including Capacity Planning and Performance Engineering. What value SETDS could bring to a company? I will formulate that later during and after my CMG'12 presentations on which you are welcome to attend (see agenda: CMG'12)! 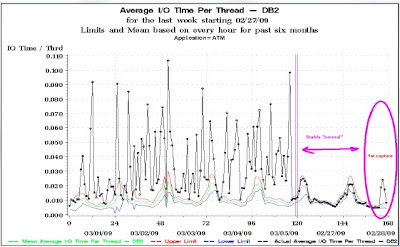 Online anomaly detection is an important step in data center management, requiring light-weight techniques that provide sufficient accuracy for subsequent diagnosis and management actions. This paper presents statistical techniques based on the Tukey and Relative Entropy statistics, and applies them to data collected from a production environment and to data captured from a testbed for multi-tier web applications running on server class machines. The proposed techniques are lightweight and improve over standard Gaussian assumptions in terms of performance. The online detection of anomalies is a vital element of operations in data centers and in utility clouds like Amazon EC2. 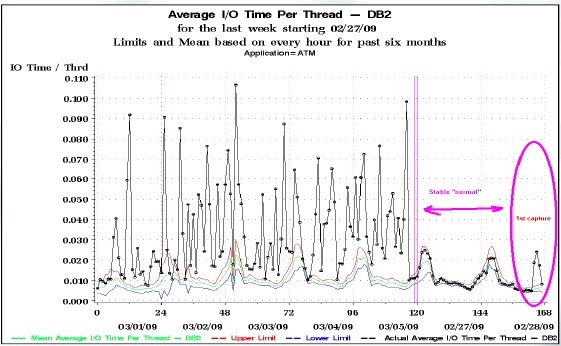 Given ever-increasing data center sizes coupled with the complexities of systems software, applications, and workload patterns, such anomaly detection must operate automatically, at runtime, and without the need for prior knowledge about normal or anomalous behaviors. Further, detection should function for different levels of abstraction like hardware and software, and for the multiple metrics used in cloud computing systems. This paper proposes EbAT - Entropy-based Anomaly Testing - offering novel methods that detect anomalies by analyzing for arbitrary metrics their distributions rather than individual metric thresholds. Entropy is used as a measurement that captures the degree of dispersal or concentration of such distributions, aggregating raw metric data across the cloud stack to form entropy time series. For scalability, such time series can then be combined hierarchically and across multiple cloud subsystems. Experimental results on utility cloud scenarios demonstrate the viability of the approach. EbAT outperforms threshold-based methods with on average 57.4% improvement in accuracy of anomaly detection and also does better by 59.3% on average in false alarm rate with a `near-optimum' threshold-based method. 6. Krishnamurthy Viswanathan, Lakshminarayan Choudur, Vanish Talwar et al. (2012) Ranking Anomalies in Data Centers, 1-8. In NOMS. 7. Greg Eisenhauer, Matthew Wolf, Chengwei Wang (2010) Monalytics : Online Monitoring and Analytics for Managing Large Scale Data Centers. In ICAC. That is the part of Machine Learning Lectures: https://class.coursera.org/ml/lecture/preview/index. "Gut-feeler 1" • A comment on the math for availability calculations: Certainly not being a math hero, I can still understand that playing with formulas can be much fun. But we ought to take care whether the results generated by these formulas are actually producing value in real world situations. IT architects do also carry responsibility - it might be somewhat limited when desining a webshop for selling cosmetics or toys, when only the shopowner would be disappointed after investing in additional nodes and not getting the expected reliability in return. But for instance, when building 911 emergency communication systems controlling police, ambulance and fire brigade services, lives are at stake and could be lost due to system outages. Here, only the most reliable IT infrastructure is good enough - and creating false expectations by misleading formulas would be fatal. "Engineer 1" • ... I disagree with Gut-feeler1's bridge building analogy. My father was involved into real bridges design and construction and he always started with pretty heavy math modeling and calculation. I cannot imagine that modern bridges are built just by the "gut feeling". Again I agree with "Engineer 3" I am for the engineering approach in clusters design that combines math modeling and applying the best practice experience. I have just got acceptance notifications about my two new CMG papers I wrote and submitted for this year CMG'12 conference. Both abstracts are published here CMG'12 Abstract Report. Below is the abstract of the 1st one which is base on the successful project I had this year. AIX frame and LPAR level Capacity Planning. User Case for Online Banking Application. The paper shares some challenges the Online Banking Capacity Management team had and overcame during the Solaris to AIX migration. The raw capacity estimation model was built to estimate AIX frames capacity needs. The Capacity planning process was adjusted to virtualized environment. The essential system, middleware and database metrics to monitor capacity were identified; business driver correlated forecast reports were built to proactively tune entitlements; IT-Control Charts were created to establish dynamic thresholds for Ph. Processors and IOs usage. Capacity Council was established.